Every day we travel through life viewing it through lenses refined over time. Some of us are near-sighted, some of us far-sighted, and some of us have 20/20 vision – all the result of decisions we’ve made and experiences we’ve lived. Every now and then, something happens to change our view akin to going to the eye doctor and getting a new prescription. Sometimes the most impactful and lasting changes result from decisions we’ve made, and the meaning we give them through stories we tell ourselves and others. Sometimes life’s changes are the result of someone else’s experience relayed in a way that resonates strongly. I was given a new set of glasses this past week when I met with Aron Ralston for lunch in Las Vegas before hearing him tell his story. Many of you know Aron as the main character in the movie 127 Hours, and the author of the book “Between a Rock and a Hard Place.” Anyone unfamiliar with those two stories will know him as that dude who cut off his own arm after having it pinned against the wall of a canyon by an 800 pound boulder while on a hike in Utah. I encourage EVERYONE to find an opportunity to hear him speak. Hearing Aron tell his story and the light it shines on his life and others’ is a unique and powerful experience. The cool part about Aron is he comes across as “just another guy”. Spend a few moments with him and you realize how bright he is, and what a deep thinker he is. While a very approachable, humble and grateful person, he’s also an incredibly talented outdoorsman and mountaineer whose love of adventure and the outdoors continually puts him in risky situations. Compared to Aron’s ordinary adventures, the trip that nearly ended his life ten years ago this week seemed far less risky than other things he does for fun. Yet it was that walk through Blue John Canyon that started on April 26, 2003 – ten years ago today – that changed Aron’s life forever. While each of us would like to think we’d do what Aron did to save our life in a similar situation, the truth is none of us will likely ever be in that position. Thankfully. But we all encounter challenges, and that’s where everyone can connect with Aron’s story. Some of us confront death prematurely. All of us face situations where our view of reality is altered as a result of decisions we’ve made – sometimes for the better, sometimes for the worse. Aron’s message is compelling not just because of the outcome – survival in the face of seemingly insurmountable odds – but because of the role his attitude and approach played in how events unfolded and the role it played in his survival. There are parallels between Aron’s story from Blue John Canyon (which took a week to unfold) and Viktor Frankl’s experience in a Nazi death camp (which occurred over the course of years between 1942 and 1945). It is Frankl’s experience surrounded by others confronting the same deadly environment where we see how unique it is to approach a life-threatening situation with the courage and strength required to survive, as he recounts in his book Man’s Search for Meaning. What was really needed was a fundamental change in our attitude toward life. We had to learn ourselves and, furthermore, we had to teach the dispairing men, that it did not really matter what we expected from life, but rather what life expected from us. We needed to stop asking about the meaning of life, and instead to think of ourselves as those who were being questioned by life – daily and hourly. Our answer must consist not in talk and meditation, but right action and right conduct. Life ultimately means taking the responsibility to find the right answer to its problems and to fulfill the tasks which it constantly sets for each individual. The dramatic difference between Frankl’s experience and Aron’s is the immediacy of death and the critical role each individual decision plays in such a compressed timeframe. Facing comparable challenges, it’s understandable how many people would accept their fate either as a hopeless situation (“not me” screams every reader) or as a challenge to be confronted. Many people would likely do things differently than what Aron did, if for no reason than they don’t have the experience spending long periods of time alone outdoors. Or they don’t have Aron’s survival training. Or, if they did everything exactly the same but timed it differently, the result would likely be different and tragic. Fate did play a role in Aron’s survival. But so did his approach to the challenge. In the end, it was Aron’s connection to something important to him outside the canyon – his connection to family and friends – that gave him hope and strength to survive. His vision of others and their role in his life allowed Aron to adjust his attitude toward the challenge presented and gave him the courage to break free from his probable grave. In the end, it was the vision of Aron’s unborn son that gave him the strength he needed. Similarly, in the face of challenges Frankl focused on the love of his wife and drew strength from that connection. That brought thoughts of my own wife to mind. And as we stumbled on for miles, slipping on icy spots, supporting each other time and again, dragging one another up and onward, nothing was said, but we both know: each of us was thinking of his wife. Occasionally I looked at the sky, where the stars were fading and the pink light of the morning was beginning to spread behind a dark bank of clouds. But my mind clung to my wife’s image, imagining it with an uncanny acuteness. I heard her answering me, saw her smile, her frank and encouraging look. Real or not, her look was then more luminous than the sun which was beginning to rise. The trailer for the movie 127 Hours states “Anything is possible with a will to live.” Aron acknowledged in Las Vegas that his experience was deeper than that, acknowledging everyone has a will to live – survival for the sake of self-preservation. That isn’t what made his escape and survival possible. It was his will to love – survival for the sake of others. It was his realization of the importance others played in his life and his sense of gratitude over those 127 hours that kept him alive longer than he thought possible and gave him the courage to break free. In the end, both Frankl and Aron could justifiably curse fate (damn the luck) and give up control of their situation. While trapped Aron has 127 hours to reflect on things he could’ve done differently to prevent “fate” from dealing him a bad hand. Frankl had years to consider the role circumstances play in dictating whether someone lives longer or dies sooner. The experiences of camp life show that man does have a choice of action. There were enough examples of a heroic nature, which proved that apathy could be overcome, irritability suppressed. Man can preserve a vestige of spiritual freedom, of independence of mind, even in such terrible conditions of psychic and physical stress. . .
And there were always choices to make. Every day, every hour, offered the opportunity to make a decision, a decision which determined whether you would or would not submit to those powers which threatened to rob you of your very self, your inner freedom; which determined whether or not you would become a plaything of circumstance, renouncing freedom and dignity to become molded into the form of the typical inmate. . . Even though conditions such as lack of sleep, insufficient food and various mental stresses may suggest that the inmates were bound to react in certain ways, in the final analysis it becomes clear that the sort of person the prisoner became was the result of an inner decision, and not the result of camp influences alone. Fundamentally, therefore, any man can, even under such circumstances, decide what shall become of him – mentally and spiritually. He may retain his human dignity even in a concentration camp. Dostoevsky said once, “There is only one thing that I dread: not to be worthy of my sufferings.” These words frequently came to my mind after I became acquainted with those martyrs whose behavior in camp, whose suffering and death, bore witness to the fact that the last inner freedom cannot be lost. It can be said that they were worthy of their sufferings; the way they bore their suffering was a genuine inner achievement. It is this spiritual freedom – which cannot be taken away – that makes life meaningful and purposeful. . . If there is meaning in life at all, then there must be a meaning in suffering. Suffering is an ineradicable part of human life, even as fate and death. Without suffering and death human life cannot be complete. What is a person’s life if not a story? Can a good story exist without suffering and conflict? Don’t we all face conflict every day? Is it conflict or how they respond to that conflict that defines the person? Ten years ago today, Aron went on a hike that caused great suffering. When he broke free after 127 hours, he began to heal. Along the way he found a deeper purpose by understanding his message about the lessons he learned could help others. He and Frankl understand every person’s story is the result of little and big decisions made every day. If you make good decisions, you get the opportunity to continue making decisions. If you make bad decisions, someone else (or something else, like fate) makes decisions for you. While it may be difficult to see along the way, the challenges you face can create great opportunities. As a result, events and challenges don’t define you. How you respond to those events and challenges is what defines you. 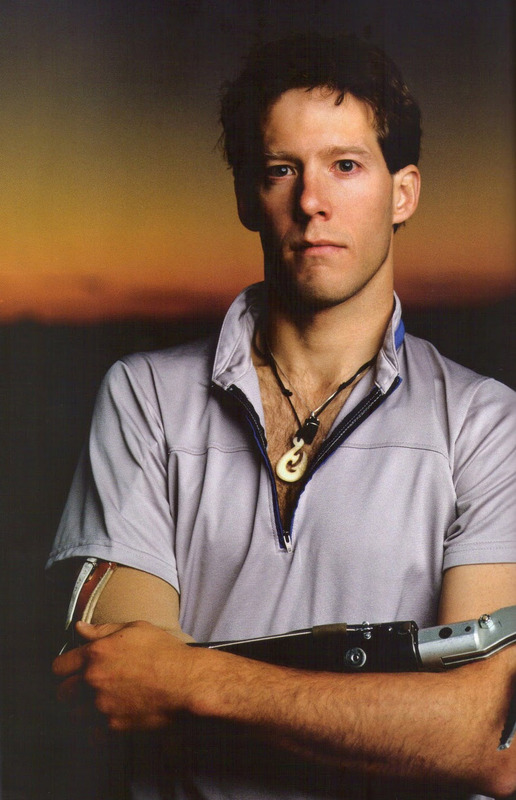 So thank you, Aron Ralston, for serving as an optometrist, and helping bring life a bit more into focus.